If you have only one custom field it is already "selected" so just click it to open the select and select, in this case "Color" again. A new blank custom field will open. The layout is confusing, the currency symbol is for the left field. "Value" refers to the text you want to show in the drop down. If there is no price difference if this variant is chosen then leave the "Price" field blank. If e.g. this variant costs $2.00 more than the base price then add 2.00. If the price reduces then add e.g. -1.00. Re-select the "Color" dropdown as many times as you need a new variant. A new custom field will appear each time. DO NOT forget to click "Save" at the top of the page before closing the product page! 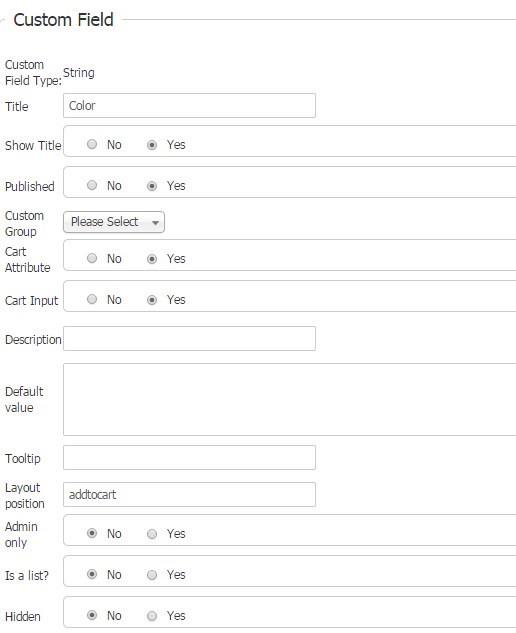 Now check the frontend for this product and you should see your variant drop down select.